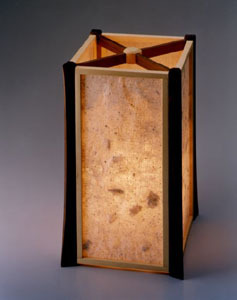 This design was a limited production run of twenty lamps. Each post is faceted and curved, and the round center piece where the cross pieces intersect is made of Alaskan cedar. The paper is made of abaca fiber, thin strips of mica stone, and paper pulp. When the lamp is unlit, the paper shade appears solid and reflects light. When it is lit, the paper emphasizes the inherent translucency of the materials--a nice effect. I recently sold the last lamp of this production run through Guild.com, which is a website devoted to selling works from some of the country's finest artists and craftspeople.